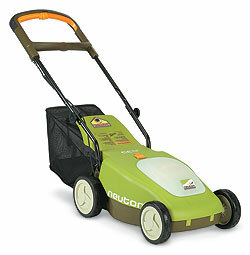 For a superb battery mower, check out the 14" Neuton CE 5.2. This little green machine is ideal for all types of small lawns! Achieve a beautiful lawn without breaking your back (or bank) with a battery-powered Neuton. It's ease of use, lightweightness, powerful cutting, and stronger-than-steel construction is a real bargain under $400. Say goodbye to smelly, loud, obnoxious gas mowers. The Neuton is so quiet you can mow the lawn early in the morning without waking the neighbors. Compared to a gas mower, a battery-operated Neuton is a wise investment. Instead of spending around $70 per year for gas and maintenance for your gas mower, you will end up spending around $2.50 a year for electricity. I highly recommend the Neuton! If someone in SoCal wants one of these, I have one for sale $150 and its yours. Welcome to the world of the battery powered lawn mower. This is the era where gas powered mowers are slowly becoming a thing of the past. This new change in lawn maintenance is already on us and Neuton Battery Lawn Mowers are one of the major reasons why this lawn care will change forever. I use to own a gas powered motor and I use to deal with all of the problems that went along with gas powered motors. These problems included everything from buying gasoline and making sure the engine had enough oil in it to keep it running smoothly. To make a long story short, my Neuton Battery Powered Mower doesn't present these type of problems. I own a Neuton CE5 Mower and it's easy to use and it takes little or no effort to maintain. The first thing about my Neuton CE5 Mower is the fact that it's fairly lightweight. The mower weighs around 35 - 40 lbs. without the battery. The added battery puts another 10 lbs. The relatively light weight of the mower makes cutting grass virtually easy and problem free. Even if you have tall and thick grass the Neutron CE5 Mower can make the process of removing this grass less stressful and more manageable. This is in part because of the battery power that this lawn mower harnesses. Now according to the stats listed with this product this lawn mower has enough power to cut 1/4 of an acre of grass on a single battery charge. Honestly, with most gas powered push mowers you would run out of fuel before being able to reach that point. The other great thing about the Neuton CE5 Mower is the battery. It takes about 12 hours to charge up the battery. The battery charge last for over an hour if you ask me. It usually takes me about an hour to cut my grass, so I would have to say the battery power does last for more than an hour. Here is what else is special about the Neuton CE5 Mower you need a key to get it started. Stick the key into the switch and move the slide bar on the push handle into the "cut position" and you're ready to get started on your grass. When you want to stop cutting the grass all you do is release the slide bar and the mower will just shut off. When you want to start it back up again, all you do is slide the bar back to the cut position and you'll be good to go. It comes with lots of well needed accessories. Things like a rear grass collection bag, a trimmer edger etc. The Neuton Mower is the best lawn mower I ever used and I would recommend it to anyone. The price for the CE5 is about $400 but it's a worth while investment. Keep in mind there is a CE6 model and it runs nearly $500. This is one piece of lawn care equipment that I would highly recommend to many people. The price shouldn't scare anyone away, because it will actually be worth the cost in the long term. I recently replaced my old lawn mower with a new Neuton CE 5.2 that works on electricity , I was tired of having been limited by cord lengths, and tangled up wires.. so I chose to buy a this lawn mower and i'm very satisfied with it.. it didn't cost to much and every time I use it I am amazed buy how easy to use it is. From the moment you start it up and squeeze it's handle to get going, you get a great feeling of control over it because of it's ease of use the versatility of it is also amazing, you get your grass bagged or discharged within a snap. I'm not sure how much more I can describe it because it's so friendly with the user as well as friendly with the environment it's energy consumption is incredibly low the performance are above average I would give it a 8 out of 10. The features are enough for everything you might need , and it's not over flooded with features so you get a headache from operating it..I recommend it an awesome little machine the Neuton CE 5.2 electric lawn mower !